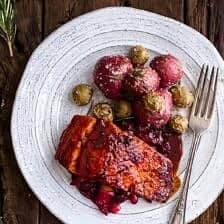 Maple Bourbon Glazed Salmon w/Sweet Cranberry Chutney + Salt Roasted Potatoes. Can you guys believe it? No cheese today. What’s going on? I mean, I did not even add parmesan to the potatoes. Although, that would be pretty stinkin’ good. So even though this meal may be cheeseless, I still love it. I guess I swapped the cheese for the bourbon today. And bourbon on a Thursday? Yeah, it’s still a good idea. With things being so busy lately, I have been in need of super quick cooking, hands off meals. Normally, I just make tacos, pizza or some kind of stir fry. OR my specialty…which is basically all the leftovers in the fridge mixed with whatever grain I have on hand (normally rice) and then topped with lots of cheese and baked until melted goodness. The boys think it is totally disgusting and will not even try it, but I have actually grown to really love these “throw everything in” meals. I often top them with fried eggs though, so this may be why I love them. Last week though I actually bought fresh salmon for the first time since probably July. I just haven’t been feeling like fish as much lately, but then I had the idea for a bourbon glazed salmon and suddenly my fish aversion was gone! The glaze just seemed so fall like, and then of course the chutney really made things perfect for November. If Thanksgiving was not all about the turkey, I would totally make this Salmon instead. Here is the deal with this meal. It’s super simple and literally just some bourbon, soy sauce and orange juice simmered down with maple syrup. It’s not weird or unusual, just simple, quick and good. Since I am me, I couldn’t just leave the salmon to hang out all alone, so a chutney was made. And wow, I am now a huge chutney fan. 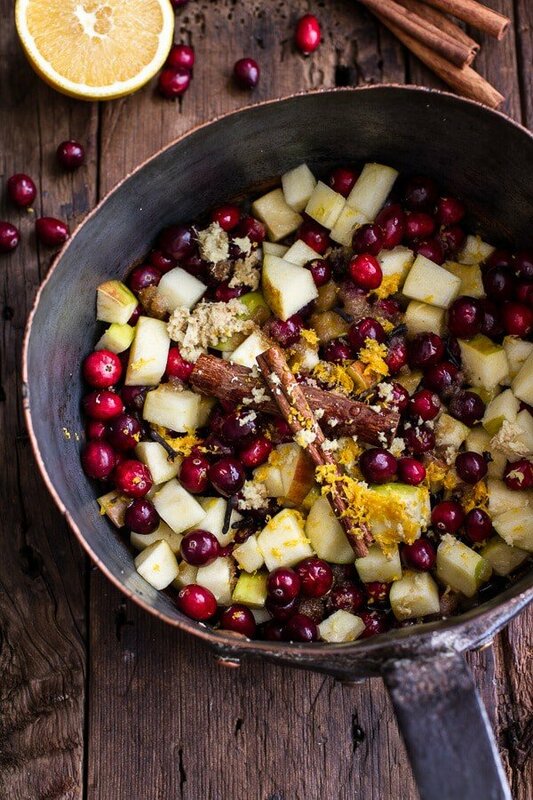 The cranberries are SO good when paired with a few fall spices and a little brown sugar. The brown sugar is a MUST, without it the cranberries taste way too tart and well, not good at all. Cranberries are one of the only fruits that I think has to have sugar added to them. Some people only need a little sugar with their cranberries and some people need A LOT. I think I am somewhere in the middle, but use a little or as much brown sugar as your taste requires. Oh, if you want your house to smell like Thanksgiving, make this chutney. It’s the best smell. AND it’s also the perfect meal for busy “holiday season” nights. And yes, I do consider November the start of the Holiday season. Plus, it’s actually pretty healthy. Random little side note here, my windows arrive today! This means aside from the doors, the barn will be all enclosed come Monday. The doors are on their way, so soon enough the barn will all be sealed up. Things are looking more home like down there!! YEAH! Oh, I almost forgot the potatoes. They truly are the simplest thing ever. You just need a decent amount of sea salt, a little olive oil and rosemary. Then just roast away. It’s a classic, but again, so good. I think I need to make more classics, I mean, there is a reason why they are called classics. 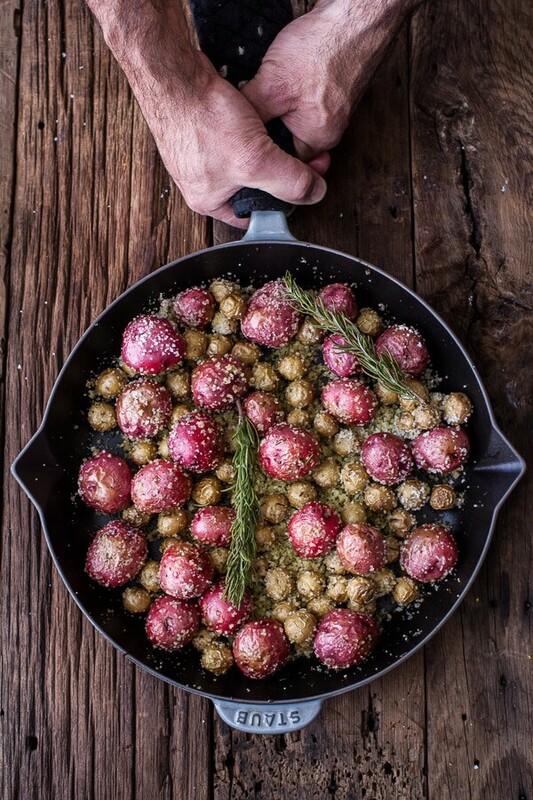 There is so much texture that goes along with these potatoes. Crunchy on the outside, soft on the inside. Pretty much the best thing ever. PLUS, aren’t those tiny little potatoes the cutest? I love them! 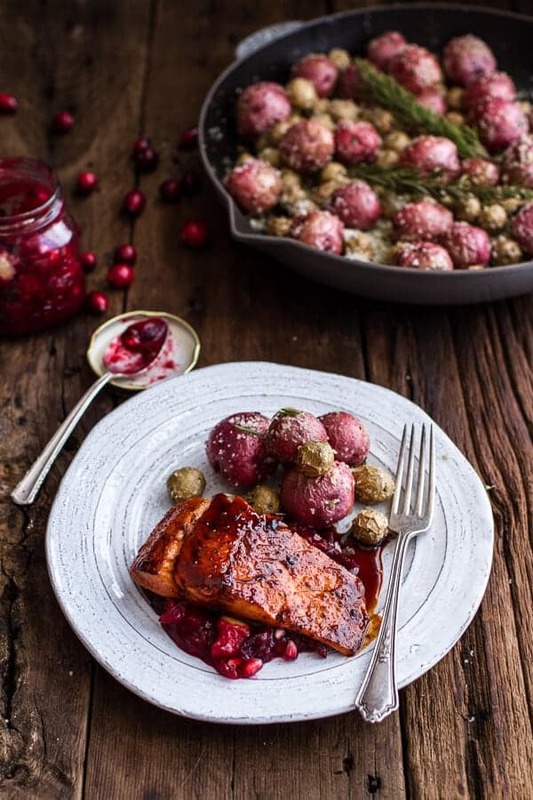 Maple Bourbon Glazed Salmon w/Sweet Cranberry-Apple Chutney + Salt Roasted Potatoes. It's super simple and literally just some bourbon, soy sauce and orange juice simmered down with maple syrup. It's not weird or unusual, just simple, quick and good. 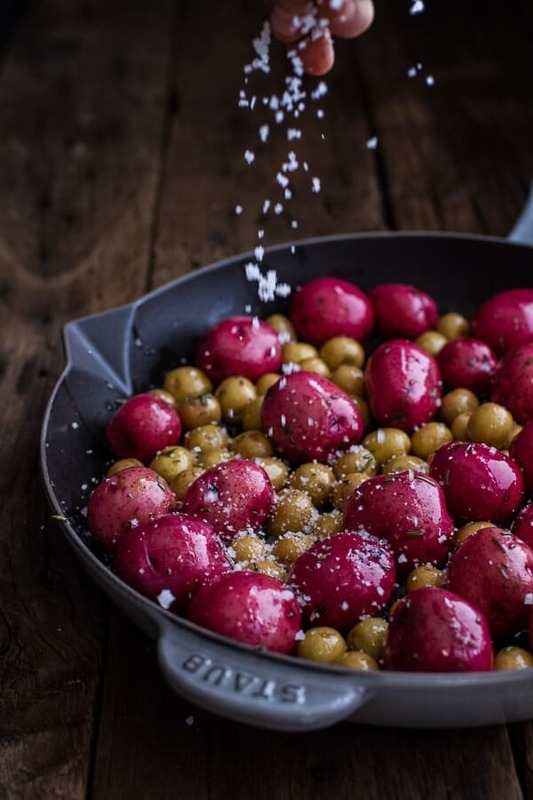 Arrange the potatoes in a single layer in a roasting pan. Pour the olive oil over them and turn to coat well. 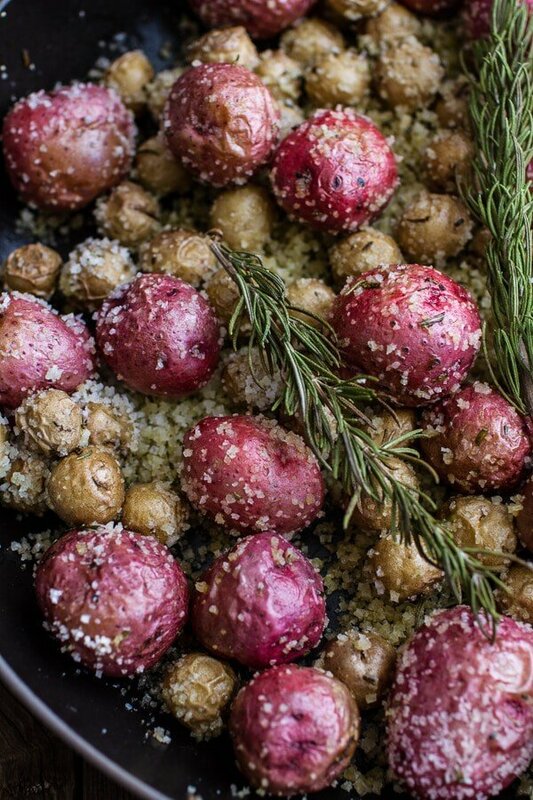 Sprinkle with the salt and 1-2 tablespoons chopped fresh rosemary (I used 1 tablespoon), turn the potatoes again and tuck in a few fresh rosemary sprigs. Roast until the skins are slightly wrinkled and the insides are tender and creamy when pierced with the tip of a sharp knife, about 45 minutes. Meanwhile, place the salmon on in a 9x13 inch baking dish. In a small bowl whisk together the maple syrup, bourbon, soy sauce, orange juice and cayenne pepper. Pour the sauce over the salmon. Let that sit for a little while you prepare the chutney. 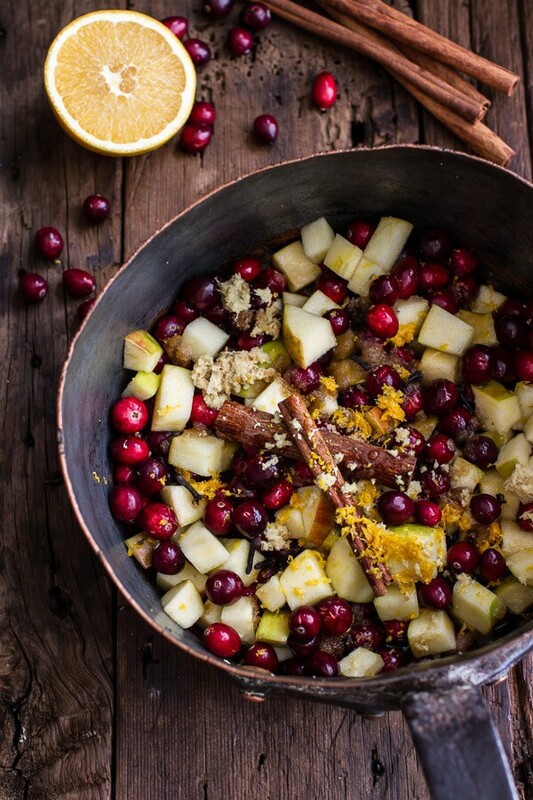 In a medium size sauce pot, combine the cranberries, apples, apple cider vinegar, brown sugar, orange zest, ginger, cinnamon stick and jalapeno (if using). Pour in 1 cup water and bring the mixture to boil. Reduce the heat, cover and simmer 20-25 minutes or until the sauce has reduced and thickened and the cranberries have burst. Taste and add more brown sugar if needed. Remove from the heat to cool. While the chutney is cooking, cook the salmon. Heat a medium size skillet over medium-high heat and add a tablespoon of olive oil. Remove the salmon from the bourbon-maple mixture and carefully add to the hot skillet, skin side facing up. Sear the salmon for 3-4 minutes and then flip and continue cooking for another 4-5 minutes or until the salmon reaches your desired doneness. Cooking times will vary depending on the size of your salmon. Remove the salmon from the skillet and place on a plate. Reduce the heat to low and carefully pour in all of the bourbon-Maple mixture. Bring the sauce to a boil, reduce the heat and simmer until thickened by half and the sauce is syrupy. Remove from the heat and drizzle the hot glaze over the salmon, reserving some of the glaze for serving. To serve, place a little cranberry chutney on the bottom of a plate. Place the salmon on top of the the chutney and drizzle the salmon again with the bourbon-maple glaze. Add the potatoes to the side of the plate. Enjoy! And now that we ate so healthy today, that leaves us room for butter tomorrow, right?? 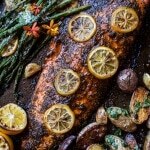 One Pan Lemon Roasted Salmon, Potatoes and Parmesan Asparagus. 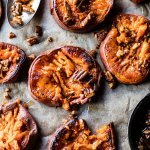 Crispy Roasted Sweet Potatoes with Bourbon Maple Butter. 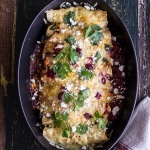 Roasted Chicken + Smoked Gouda Enchiladas w/Fire Roasted Tomatillo Cranberry Sauce. Oh Tieghan I really loved this post, the salmon will be happening for dinner sometime over the next week! AWE!!! Thanks so much, Rachel! 😀 Happy Friday to you too! And mozzarella, mozzarella is always the answer. Basically, it is cows milk cheeses that don’t like me! This salmon is so beautiful, so making it! Love this recipe…I’m a huge chutney fan and those roasted potatoes look so good…can’t wait to try this. Thanks Lisa! I am just getting into chutney, but I am loving it! I have to admit, cranberry sauce is one of my favorite parts, if not my favorite part, about Thanksgiving! I haven’t tried chutney before, but it looks just as good! You will love this chutney then!! It’s like cranberry sauce, but a little thicker. Thanks so much and have a great Friday! Looks so delicious and I’m not even a salmon fan. Great job Tieghan! Salmon is just so amazing, and this glaze just sounds to-die-for! And those potatoes look so comforting! I am totally craving a bowl full! 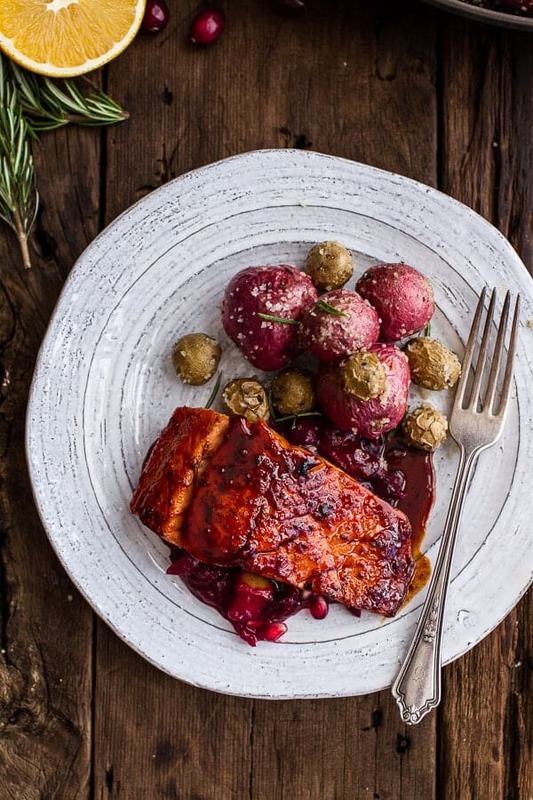 The salmon looks fabulous, but those potatoes…I want to eat a whole bucket full of those! So as I’m scrolling through I’m going “oh my godness THAT picture… no THAT picture…. wait stop this one’s too good.” And on and on. I love how simple this salmon is– 4 major ingredients for a flavorful glaze? Pinned! THANK YOU! I am so happy you like it!! Have a great Friday! I’m always looking for new salmon recipes that don’t mask the salmon’s natural flavors, but this looks perfect. Excited to try it out this holiday season! Thank you, Cynthia! Hope you love it! 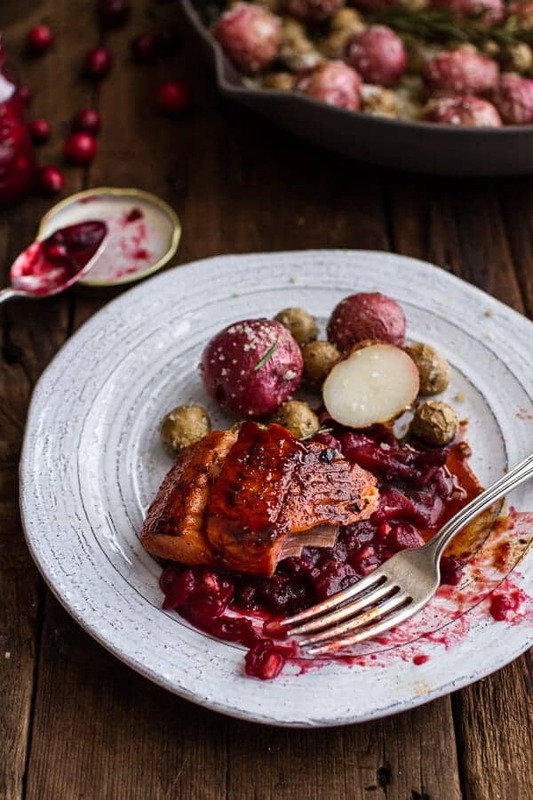 Love that bourbon glaze for the salmon and those potatoes – I could eat the entire skillet! Thank you so much, Jennifer!! That means SO much! 🙂 Hope you have a great Friday! Can the chutney be made a day ahead? Yup, just store it covered in the fridge until ready to use. Hope you love this meal! I am making that chutney immediately. I’m not going to stop thinking about it until I do! And you sound just like my boyfriend. Randomly he’ll say, “NO! I just realized I haven’t had any cheese today!” Then he will go in the refrigerator and break of a piece and be happy again, haha! Thanks Cristina! Hope you love the chutney! Salmon and cranberries together sound lovely!! I’ve got two big bags of cranberries right now, and I’ve been wondering what I’ll do with all of them…cranberry chutney to the rescue! It is such a great combo for sure! Hope you love it, THANKS! Beautiful, Beautiful, Beautiful! BTW, did I say just how gorgeous your pictures are? Well, they are…and the combination of the ruby red chutney against the burnished glaze of the salmon! Let’s just say my salivary glands are working overtime. Definitely will be making this stunning and delectable fall dish. THANK YOU so much!! Hope you love the salmon! Looks delicious – loving salmon at the moment. Also can’t wait to try the chutney, it will be perfect for many dishes over the festive season! Everything going on here looks so good, I wouldn’t even miss cheese (and that’s saying something for this Midwest cheese-loving girl ;)). Bookmarking for holiday dish ideas! Thanks Stephanie! Hope you are having a great weekend! Oh man… those potatoes look KILLER! You always post the most beautiful and inventive recipes. Love your blog! Great recipe, will try it! I love the plate your using, were’d you get it? Thank you! The plate is from Antrhopologie. This was an amazing dish- made it last weekend. Love your recipes!!! So happy you loved this! Thanks Kara! I have made this fabulous dinner twice now – and the potatoes three times, twice with baby reds and once with the “correct” sized potatoes – harder to find, but worth the hunt as, for some reason, the quartered reds roast differently than the intact little spuds. Everyone still raves, but those who raved most had the “real deal”. 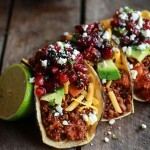 Thank you for this wonderful blog and great recipes. So happy you love this!! Thank you so much, Diane! YEAH!! So happy you loved this! Thanks Cara! I made this tonight and I have to say that it was easily one of the best salmon dishes I’ve ever had. That chutney was absolutely beautiful and tasted out of this world! You are wonderful! I can’t wait to try out more of your dishes!! SO happy you loved this!! Thanks!! Would it ruin the glaze if I left out the bourbon? Is there anything non-alcoholic I could substitute? This is a wonderful meal. Just made it for friends and it was a big hit. Will be on my go to list from now on. Chutney was a delicious side. So happy you liked it Judy!! Thank you!! This looks awesome! I want to make it for a Christmas lunch. Do you think the salmon could be baked, just to simplify things for a larger crowd? Hey Theresa! Yes, I think baking the salmon will be just great. Let me know if you have questions. Thank you! I do have a question though… are there mushrooms in the potato recipe? The picture shows mushrooms, but I don’t see them on the recipe. Is it alright to add them in with the potatoes w/o changing the potato taste? I’d like to add them as the picture looks delicious. Hi Connie!! Of course you can add mushrooms! It will be delicious with the potatoes, just toss them right in. Let me know if you have questions. Hope you love the recipe! It looks absolutely delicious!!! Is there anything I could sub the orange juice for? I have an allergy to all citrus fruit and juices..
HI! Would using pineapple or pomegranate juice work for you? I think either would be great. Please let me know if you have any other questions. Hope you love the salmon! Thanks so much for your quick reply! So the only fruit juice I could have would be one from a berry.. would cranberry juice work too? Cranberry juice will be great! I am thinking of making this for Christmas. It looks delicious! Can I bake the salmon instead of searing it? If so what degrees and how long? Bourbon and salmon- what’s not to love? Thanks, it was great!